Harrison Ford's father was a local advertising executive who sometimes worked as a radio actor, and his mother was a former radio actress who stayed home and tended the children. The family was of all-American mixed heritage, German, Irish, and Catholic on his father's side, Russian Jewish on his mother's side. As a boy, he was 'Harry Ford', a C student in high school who never played sports, but he tinkered with electronics in the school's radio club. His school district had (and still has) its own radio station, but that nerdy hobby scored Ford no particular popularity. He says he never dated in high school. In college he signed up for drama classes for, he has said, two reasons: He thought the class would be easy and thus raise his low grade point average, and he was hoping to meet women. He got a good grade, and met and married a woman from that class, but he also discovered that he loved performing. He made his first stage appearance as Mac the Knife in the school's production of Threepenny Opera, but he was inevitably expelled from college, due to academic problems. He sidestepped the military draft -- and the Vietnam war -- by filing as a conscientious objector. When he was required to appear before the draft board and explain his stance, he instead feigned general nuttiness in a performance that convinced his interrogators he was not military material. Ford made his professional debut performing in locally-produced plays in Wisconsin, and soon came to Hollywood, where he worked as a carpenter while looking for work as an actor. He was eventually signed as a contract player at Columbia, making $150 a week -- good money -- but only when he was assigned a role, which was not often. He made his first screen appearance with one line as the bellhop in the 1966 heist adventure Dead Heat on a Merry-Go-Round with James Coburn. His first substantial speaking part came in the Civil War western A Time for Killing with Glenn Ford (no relation). He was an adequate actor, but he had no shyness about complaining when the scripts were poor, and he had no patience for bad advice. In one encounter, a studio executive scolded Ford for his lack of on-camera charisma, telling him that even in Cary Grant's earliest roles, even if he was playing a grocery clerk, you could tell he was destined to be a star. Ford replied, "I thought the point of acting was to make you think he was a grocery clerk." Understandably unpopular with management, Ford was eventually fired. He then signed with Universal, where he worked occasionally on TV shows like The Mod Squad, The Partridge Family, and Love American Style, before he was fired again. At that point, Ford decided that carpentry was more satisfying work than the shallow, tedious sitcom bits he was doing. By then he had a reputation as a top-notch carpenter, so he had plenty of work. He constructed a recording studio for Sergio Mendes, a sun deck for Sally Kellerman, and after The Godfather proved a huge hit, Ford was hired for an expansion of Francis Ford Coppola's office. A few months later, Ford was an actor again, working for producer Coppola and director George Lucas, playing the hot-rodder who raced Paul Le Mat in American Graffiti. He almost turned the role down, though -- carpentry paid better. He later had a small but pivotal role in Coppola's The Conversation with Gene Hackman, but acting was still Ford's secondary career. Then he was hired to build some shelves in Lucas' home, and since Lucas knew Ford was also an actor he asked him to help read lines during other actors' auditions for his next film. Eventually, Lucas decided that his cabinetmaker would be perfect as the wisecracking space pilot in the film, which was, of course, Star Wars. After playing Han Solo, Ford was finally able to put his hammer and nails in the bottom drawer and become a full-time actor. In numerous action roles over the next few decades, he came to epitomize the mythical American man -- tough, cocky, and undefeatable, but otherwise just an ordinary, very handsome fellow, easy for audiences to identify with. In addition to the first three Star Wars films, he also played the adventurous archaeologist in three Indiana Jones films, super-spy Jack Ryan in Patriot Games and Clear and Present Danger, the innocent man on the run in The Fugitive, and a two-fisted President of the United States in Air Force One. 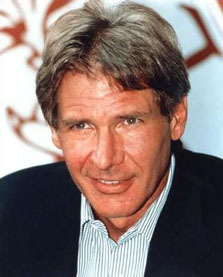 In more serious dramas, Ford played the cynical android-killer Deckard in the science fiction epic Blade Runner, the detective who went undercover with the Amish in Witness with Kelly McGillis, the inventor who hates civilization in The Mosquito Coast with River Phoenix, the prosecutor accused of murder in Presumed Innocent with Raul Julia, and in a cameo, he played "Col Lucas," the officer who gave Martin Sheen his unenviable assignment to "terminate" Marlon Brando's command in Apocalypse Now. Ford also demonstrated a nice touch for light comedy in The Frisco Kid with Gene Wilder and Working Girl with Melanie Griffith. Ford's only Oscar nomination was for Witness, but he lost to William Hurt for Kiss of the Spider Woman. The total US box office grosses for all of Ford's films exceeds $3-billion, substantially more than any other actor, ever. As of 2006, he has starred in eight of the top fifty grossing films of all time. In recent years, however, as Ford has aged, his action roles in such films as Hollywood Homicide and Firewall have drawn little interest. His first marriage ended in divorce after 15 years. His second marriage, to Hollywood screenwriter Melissa Mathison, who wrote such scripts as The Black Stallion and E.T. the Extra-Terrestrial, ended in divorce after 17 years. He has since married TV's Ally McBeal, Calista Flockhart. Not much more is known about Ford's personal life, as he disdains the media and rarely tolerates personal questions. He lives on a sprawling ranch near Jackson Hole, Wyoming, where he has designated half his acreage as a wildlife preserve. He owns at least four airplanes and one helicopter, and usually flies himself to his destination when he needs to be on either coast or on location for filming. Ever since his arrival in Wyoming, he has provided his helicopter for use by local rescue authorities, often piloting the craft himself but eschewing public credit. In 2000, publicity was unavoidable after Sarah George, a hiker on a nearby mountain, became ill due to heat, altitude and dehydration, and called for help on her cell phone. Local officials called Ford, who promptly found George on the side of the mountain, and airlifted her to the nearest hospital. The somewhat astonished woman told reporters she was embarrassed, because in her nausea she had vomited in Ford's helicopter. He got his trademark scar on the chin, he says, when he tried to buckle his seat belt while driving, and accidentally swerved his car into a telephone pole. "My parents did not practice any organized religion, although my father was raised Roman Catholic and my mother was Jewish." (Parade, 7 July 2002) Also, on Inside the Actors Studio, "As a man, I've always felt Irish. As an actor, I've always felt Jewish." He does not appear to have ever been baptized. The best inference from his behavior is that he is agnostic or non-religious. Norma Meyer, "Chat with Harrison Ford", Sign On San Diego, 22 January 2010, calling him "lifelong Democrat" and "longtime environmentalist." Legend has it that once when asked his religion, it is alleged that his response was "Democrat." Unfortunately there is no good source for this claim.